Grab great co-op games for 50% (plus) off now! 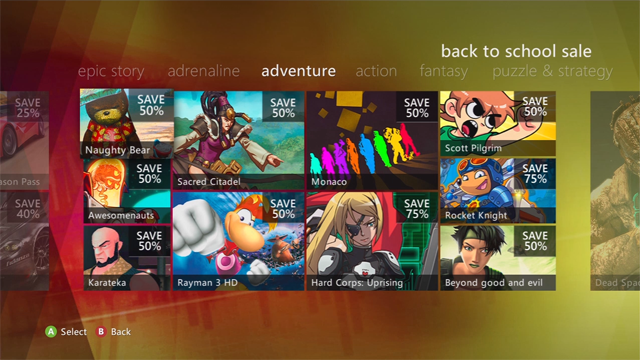 A ton of Xbox Live Arcade titles just went on sale to close out the summer and begin the fall season. What’s even better is that many of them have great co-op modes! Head on to the Marketplace today to see what you can buy for fantastic prices. The “Back to School Sale” is currently underway on the Xbox Live Marketplace, with over two dozen games’ original price tags dropped halfway or more. It’s going one until Monday, September 9th, so if you have any change leftover from the various summer sales on Steam and such, we highly recommend looking into picking up what you can now. You can’t beat grabbing co-op titles like: Monaco, Awesomenauts, and Scott Pilgrim vs. The World: The Game at the prices they are now. Page created in 0.7586 seconds.